The swim was a 1,500m in a U shape with exit half way back along the lake side. Standing at the start on the lake side it was hard to spot all the yellow buoys in the sun rise. One of the other triathletes said just head for the tallest try straight ahead which seemed got landmark to spot before turning back. For the swim I started towards the left of the start wave, which was the fast side. It was a bit hectic at the start but was a good mass start practice. I left a few meters before I started but I was getting hit for the next few minutes despite it starting to space out already. I got to the turn point quite well with teh earlier sighting tip and made both of the turns at started heading back. Half way down I decided to slow a bit as the person in front had stopped to let about 5 swans swim past I thought I would play it safe and give them some distance. I then picked up the pace again and was easily to spot the swim exit which had a blow up arch. When I got out of the swim I some how dropped my googles in the murky water but grabbed them on first attempt. T1 was about 100m from the lake exit to my bike but some how managed to take only a few minutes instead of the normal 10!! The cycle was a gently undulating 39km (24 miles) loop with one stop point. The biggest issue was the slight breeze going across the farming landscape. I decided to give this a big effort and spend a lot of time on my aerobars. When I got to the first hour I had done over 19 miles which was 4 miles more than normal. With just a few miles to go I decided to see how long I could manage this pace for. When I got to the end my average pace was 19.6 mph!! T2 was a blur just over 1 minute!! The run was a 11km multi terrain route made up of two laps around the park and lake side. What I was not prepared for was the woodland section, steps and hills. This was even worse due to the fast pace I started the run on assuming it was all flat. I had to walk up the last half of the hill but ran the rest at a fast pace which I managed to maintain a 8:15 minutes/mile pace for the run. I completed the race in 2:48:29 which was not bad on a hot day. The only time which was average for me was the swim the rest where at least above average. This was shown by my position in each section being lower each time. 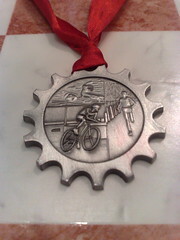 I quite like the medal we got which was in a cog shape. More details can be seen on my race report on my blog.